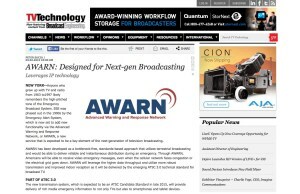 AWARN has been developed as a bottleneck-free, standards-based approach that utilizes terrestrial broadcasting and would be able to deliver reliable and instantaneous distribution during an emergency. Through AWARN, Americans will be able to receive video emergency messages, even when the cellular network faces congestion or the electrical grid goes down. AWARN will leverage the higher data throughput and utilize more robust transmission and improved indoor reception as it will be delivered by the emerging ATSC 3.0 technical standard for broadcast TV. The new transmission system, which is expected to be an ATSC Candidate Standard in late 2015, will provide delivery of rich media emergency information to not only TVs but also to smartphones and tablet devices. AWARN will also fill the gap of the promised Mobile Emergency Alert System, which was developed to push text, web pages and video to compatible equipment including mobile DTV devices. That effort was an attempt to extend EAS to mobile devices, but there were limitations, which is why it was never fully implemented. AWARN will deliver far more than just text and static maps to mobile devices and this will include full-motion video, radar images, evacuation maps and other rich-media information when needed. AWARN will further deliver multimedia alerts that utilize video, audio, text, websites and graphics to ATSC 3.0-equipped handsets, tablets, laptops, netbooks and even in-car navigation systems. In addition the system will utilize IP technology, which allows the new application to be flexible and extensible. “It is really the next generation alert and warning system for the mobile America of the 21st century,” Lawson said. The new alert system already has a growing list of participants and supporters of broadcasters and technology companies including GatesAir, LG Electronics, Monroe Electronics, Triveni Digital, NAB Labs, Capitol Broadcasting, PBS and most notably the National Association of Broadcasters. Despite the fact that this new technology essentially supersedes M-EAS, it does offer similar functionality, notably the fact that AWARN and ATSC 3.0 will integrate seamlessly with the federal Integrated Public Alert and Warning System, managed by the Federal Emergency Management Agency. Alerts generated by FEMA or state, regional, or local authorities already trigger limited broadcast and text alerts to be received by viewers and listeners. AWARN will allow broadcasters to utilize their weather forecasting and newsgathering advantages to provide valuable emergency information to mobile devices. Moreover, the addition of AWARN Emergency Alerts means that devices equipped to receive AWARN signals can be easily triggered by IPAWS to display video, photos, audio and text alerts to a variety of specially-equipped devices. Broadcasters have extensive newsgathering and weather information already available to them such as remote pick-ups and Doppler radar. While the EAS system will still be there when needed, the new AWARN is a more efficient way to stay ahead of the regulatory requirements and remain relevant in a changing world, where users are just as likely to be watching video on mobile devices rather than the TV in the living room.